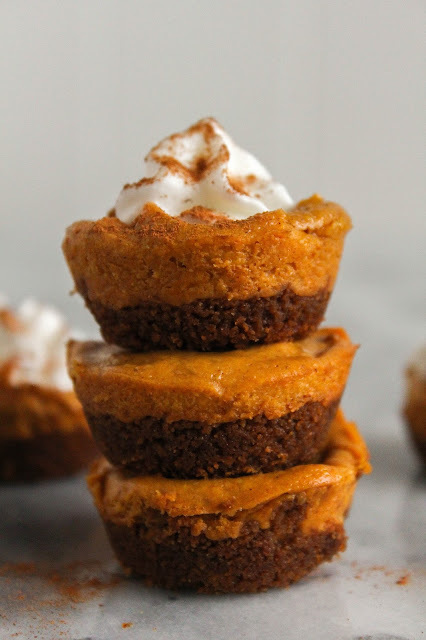 These mini pumpkin cheesecakes are the perfect light, bite sized dessert! 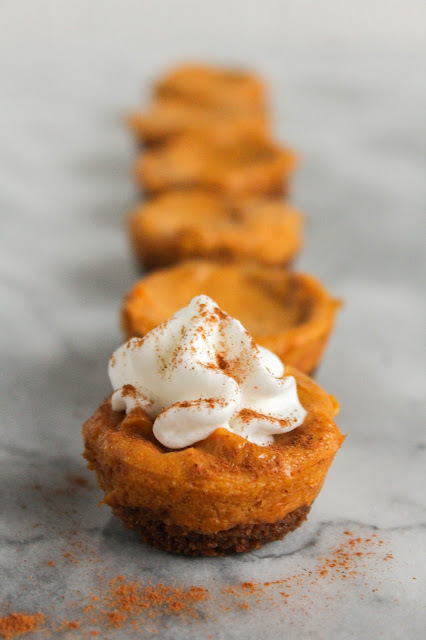 I know most people reserve their pumpkin recipes for the Fall only, but I'm one of the few that love to cook with it and eat it all year long. Maybe not so much in the summer, but the rest of the year for sure. 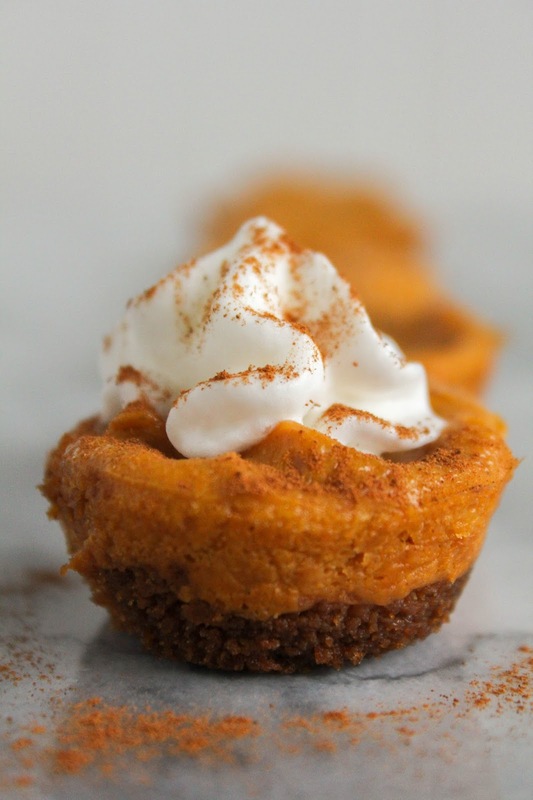 Whether I'm using it in a sweet or savory recipe, pumkin is an extremely versatile ingredient. And it's healthy, too! These adorable Mini Pumpkin Almond Cheesecakes are the perfect portable dessert for any occassion. 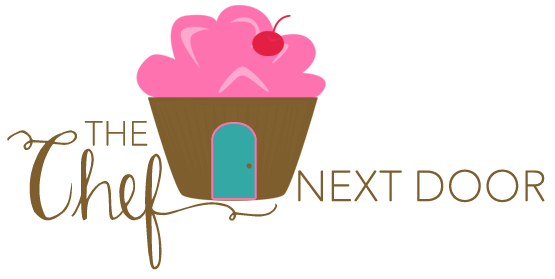 A holiday gathering, a NYE party, even just a special dessert for Sunday dinner! Made in a mini muffin tin, they are tiny bites of heaven. The crusts of this delightful dessert is made with thin Swedish almond cookies. There were a couple of different brands at my local grocery store, but if you can't find them no worries. You can also use windmill cookies or gingersnaps instead. Top the mini cheesecakes with a dollop of fresh whipped cream and a sprinkle of cinnamon, and don't be surprised if your guests eat one after after another! They are quite addictive. This is a perfect dessert for NYE or any other party for that matter. I just love how portable they are! Preheat the oven to 350 degrees. Spray a 24-cup mini muffin pan with non-stick baking spray. Add the cookie crumbs and melted butter to a medium bowl and mix until well combined. Press about a Tablespoon of the crumb mixture into the bottoms of each well in the pan. Using the end of a wooden spoon, press the mixture down to pack it in. Bake for 10 minutes, or until the crusts begins to brown. 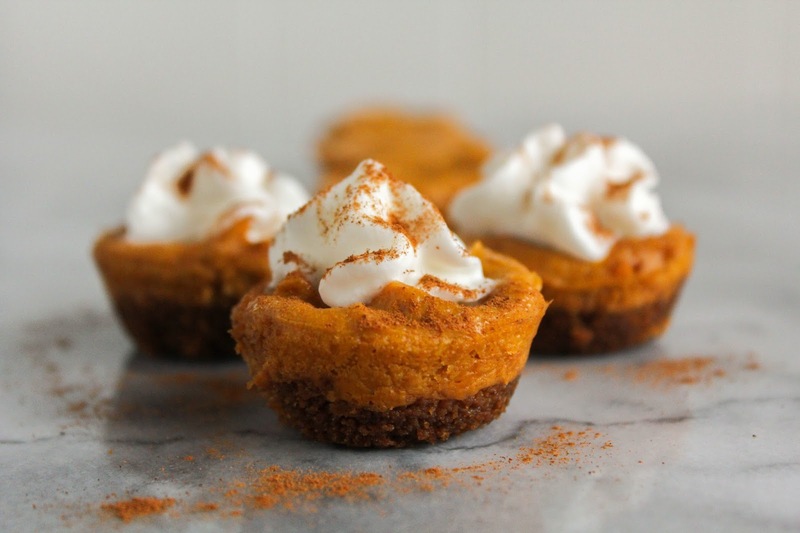 In the bowl of a food processor, add the softened cream cheese, pumpkin, eggs, brown sugar, flour, ginger, cinnamon, nutmeg and salt and process until smooth. Using a small scoop, divide the mixture evenly among the 24 wells. Bake for 10-12 minutes, or until set. Let the cheesecakes cool completely in the pan. Using a small knife, run it around the edges of each cheesecake and remove them. Refrigerate for at least 8 hours before serving. Before serving top with a dollop of whipped cream and a sprinkle of cinnamon. Store leftovers in a covered container in the refrigerator for up to 5 days.